SOSUPERSAM, or Samantha Duenas, is a performing artist from Los Angeles. Born of Filipino and Irish descent, Samantha spent her youth consumed by piano lessons, dance classes, musical theatre, and choir. She eventually made her first foray into the entertainment industry as a professional dancer, supporting the likes of Ashley Tisdale, Miley Cyrus, and Kelly Rowland. As a dancer she has appeared in numerous music videos, live television, and a national tour with Vanessa Hudgens and The Cheetah Girls. In 2008, Samantha purchased her first set of DJ equipment and has been making waves ever since. She is a seasoned DJ and a familiar name in the international music circuit. Her versatile range and genre-bending mixing style has given her opportunities to play underground clubs, music festivals, and celebrity and fashion events alike. At present, SOSUPERSAM is a member of Soulection, the worldwide record label and collective. Through these various avenues, Sam regularly performs throughout the US, Canada, Europe, Asia, and Australia. In 2013, SOSUPERSAM co-founded “143,” a monthly R&B party she hosts and DJ’s in Los Angeles. 143 prides itself in pushing the R&B culture forward and bringing in some of the hottest and most legendary names to share the stage such as ?uest Love, A-Trak, Ja Rule, Ashanti, Chad Hugo, and Ginuwine. Over the past four years 143 has become a global sensation, attracting some 1,500 attendees each month in Los Angeles, and popping up in cities all over the world like New York City, Berlin, Amsterdam, Jakarta, Manila, San Francisco, Vancouver, Miami, Honolulu, Seattle, and Boston. In 2016 SOSUPERSAM released the “SUP” mixtape series, smartly interweaving her original music in with a curation of her favorite songs. The mixtapes would culminate in Garden a 6-track EP showcasing her songwriting and r&b vocal stylings. Released independently, Gardenincludes features from Soulection’s ESTA. and Bay Area rapper P-Lo. 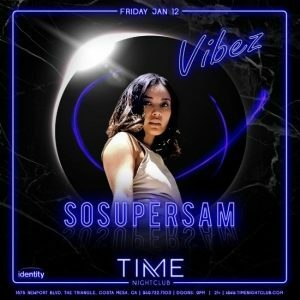 Since its release, SOSUPERSAM has sung for crowds in Los Angeles, Oakland, Honolulu, and will close out the year with her first vocal performances in Asia. In 2018, we can expect SOSUPERSAM to release a new music project, and embark on a cross-country US tour.